While some actors can effectively balance feature and TV roles, Mad Men‘s John Slattery has stayed firmly on the former side, with his only recent major Hollywood gig being last year’s The Adjustment Bureau. His latest project sees him on the independent track, for a small drama that premiered at South by Southwest earlier this year. 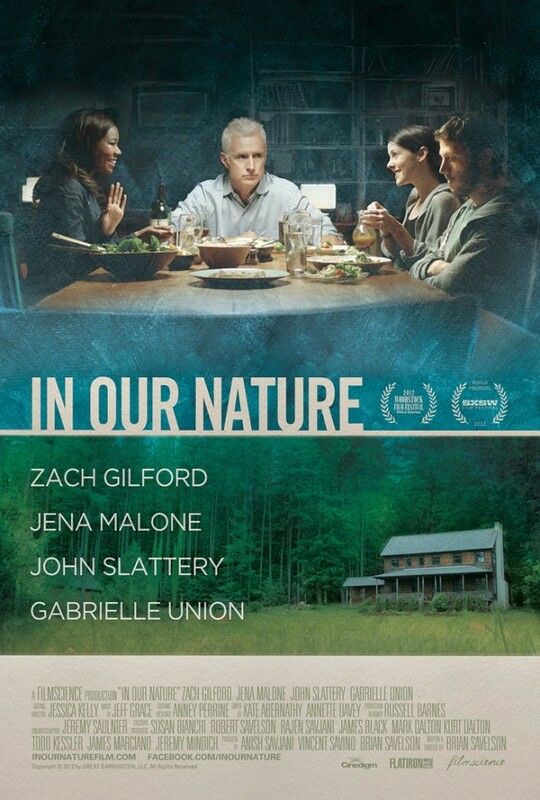 Directed by Brian Savelson, In Our Nature also brings together Zach Gilford, Gabrielle Union and Jena Malone in a story of an unexpected family getaway. During SXSW, we said the film has “several strong and subtle moments, building to a strong conclusion where much is insinuated. The performances are strong and nuanced and make good use of the breathing room in Savelson’s script. For a debut, the direction is equally as restrained and genuine, beautifully lensed. The clashes over the past and future are not easily resolved — in a lesser mellow drama the answers would be easier found. Ahead of a release next month, one can check out the new trailer below via Yahoo, along with the poster. When Brooklynite Seth (Zach Gilford, “Friday Night Lights”) takes his girlfriend Andie (Jena Malone, “Into the Wild;” “The Hunger Games: Catching Fire”) to his family’s weekend house in upstate New York for a romantic getaway, they are unexpectedly joined by his estranged father Gil (John Slattery, “Mad Men”), and his much-younger new girlfriend, Vicky (Gabrielle Union, “10 Things I Hate About You”). The women carefully negotiate emotional minefields as they persuade father and son to share the house for the first time since the summer vacations of Seth’s childhood. This unexpected family reunion in the great outdoors, fraught with tensions old and new, pushes them all to realize the bonds of family are always stronger and stranger than expected. From the producers of “Meek’s Cutoff” and “Wendy and Lucy,” IN OUR NATURE is a candid, delicately observed family portrait of couples at a crossroads. In Our Nature hits theaters on December 7th.